ACORN presents “What’s Organic About Organic?” Community Info Sessions in Nova Scotia! WHO grows organic food in NS? Tegan Renner of ACORN will address these questions and more in these one-hour evening sessions. There will be plenty of time for discussion, so come prepared with your thoughts and questions! Suggested donation of $5 to ACORN accepted at the door. Snacks provided by Nature’s Path. When: Sunday, August 16, 2015 from 1:30-3:30/4pm. Heather Squires is welcoming us for a tour of the Lunenburg County farm where she is raising goats and heritage-breed pigs and chickens. She will talk about her approach and plans for this farm, and show us the new Tamworth-cross piglets. The visit will include a short goat cheese making demo + a talk on cheese & cheese making + a semi-formal cheese tasting, with accompaniments, of Heather’s and other NS cheeses, in the kitchen. Limited quantities of pastured, whey-fed Tamworth-cross pork, bacon, and sausage will be on offer, along with cheese making supplies and cheese making kits. Cost: Slow Food Members $45. Non-members $55. Min 6 people. Max 10-12. Canaqua supplies three species of finfish (Atlantic salmon, Atlantic halibut and Arctic char) raised in land-based, closed-containment, marine (full salinity from seawater wells) facilities, now under transitional organic management. Chefs Andrew Aitken and Sarah Griebel are the owners of Wild Caraway in Advocate Harbour. They are both Slow Food members and have been part of the team of chefs producing the food at our Spring Supper for the last two years. Shannon Jones and Bryan Dyck, of Broadfork Farm, produce organic vegetables and cut flowers. 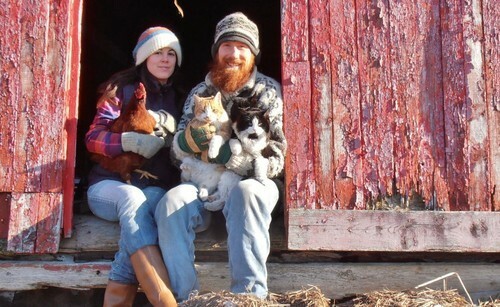 Shannon and Bryan are active as young farmers in the National Farmers Union. Cash or Cheque only, at the event.